Situated in the heart of truffle country this tastefully furnished and equipped stone cottage has a private patio and pool, shared only with the owners. 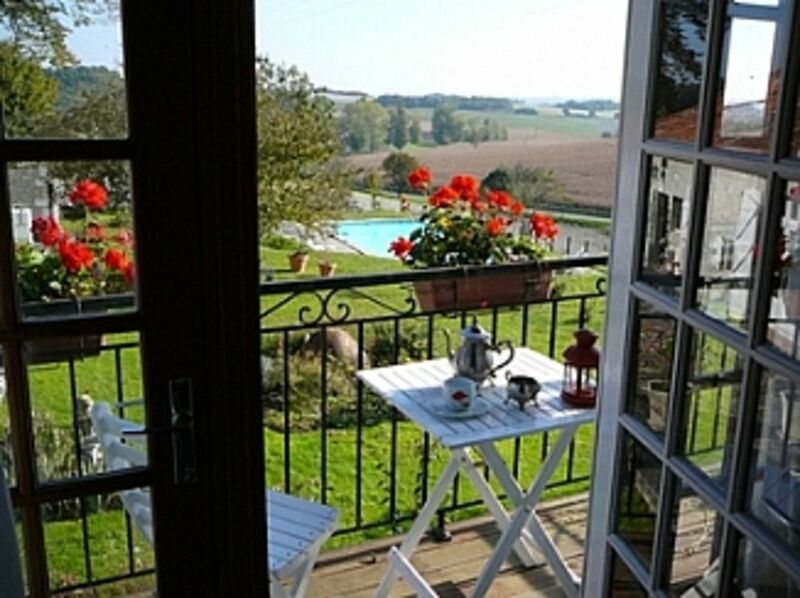 Set in the quiet countryside surrounded by sunflower fields in the commune of St. Martial de Viveyrols with its well known family run bistro and 5 minutes from picturesque Verteillac with restaurants, doctors, pharmacies, a Church, art galleries, a bakery, butcher and historic Merlauds, where everything from food to garden furniture is available. Centrally located between Angouleme with its famous annual vintage car race around ramparts, and Perigueux with its lovely old town, Roman ruins, great shopping and markets. Beautiful Brantome, the Venice of the Dordogne is nearby and Bordeaux wine areas an hour to the west, Limoges to the north. The prehistoric caves of Lascaux, towns like Sarlat, Domme and Rocamadour are great day trips. We have found the perfect place to retire and run a self catering cottage here in the beautiful, serene rural area of SW France. After visiting several times the magic of the Dordogne got into our blood and we fell hopelessly in love with the Perigord. There are wonderful walking trails, beautiful old villages, great food and tranquility. We have a lovely, salt water pool for the sole use of the guests, a cottage with it's own private patio and for the more active, we have bikes and there is a golf course or canoeing only fifteen minutes away. We are ideally situated between three airports, Bordeaux, Angouleme and Bergerac. Being fully bilingual we are able to help with any of your travel, leisure activities or dining arrangements so come and share this lovely corner of France with us. In the Dordogne we were surprised to find a culture of such richness and diversity. Pride in its ancient heritage can be seen down to the very smallest of the villages with their ever present displays of flowers. Fetes and vite greniers are held most week ends with music festivals and those magnificent marching bands with their big brass french horns. Epeluche one of our local villages holds a float pageant beautifully lit up on the meandering river that runs through the town. All this is done to a magnificent brass band topped off with the most spectacular fireworks display done to music that you have ever seen. Upwards of a hundred walkers participate in walks organized by the local Mayors. After a morning's walk we meet at the mairie where we are welcomed with aperatives and lunch. The only sounds you are likely to hear come from the quite prolific bird life or perhaps the distant drone of a farmer's tractor. We are surrounded only by pastures and the only car track is the one shared by us and our neighbors who like us. live in remote farm houses barely visible from each other and certainly out of earshot. Being out in the country away from any light pollution or any other kind for that matter the night sky is so spectacular that one could almost touch the stars they are so bright. This gives us the opportunity of conducting the sky tours with our telescope that our guests love so much. 1X Bathroom with shower, wc, bidet and separate entrance onto patio and pool area. Hairdryer included. Lounge with couch and 2 armchairs, coffee table, dining area with table and 4 chairs. Cooker, hob, fridge, washing machine, microwave, toaster, pots, pans, cutlery, crockery etc. Our son (6) described the pool as awesome! He loved the cottage and his bunk bed with doors to the balcony. He especially liked his daily chore watering the geraniums on the balcony. We enjoyed swimming everyday in the pool. The cottage is clean, tidy, well equipped with beautiful views from the balcony across the pool and fields beyond. So peaceful listen out for the owls and watch the stars of a night on the secluded patio. The Dronne & Dordogne both easy reach you can hire a canoe in many places and take a couple of hours to navigate downriver. With a nervous 5 year old in the middle we had more fun on the Dronne than at any theme park in the UK! Underground caves near Brantome are great ideal if its raining! Bergerac, Bourdeilles Brantome, St Aulaye are all worth a visit. Karin and Nick were lovely hosts, discrete but on hand to help and catch up on our daily sightseeing trips. 1 week wasn't enough! We are very tempted to return in 2014! Planned walks through this beautiful area can be organized, with a picnic lunch included, with details including sites of interest. 1 1/2 hours drive west gets you to beautiful beaches and areas well known for oysters. 5 minutes from Verteillac, 15 minutes from the market town of Riberac, 45 minutes to Perigueux and to Angouleme, 1 hour to Sarlat and the cro-magnon caves, 1 1/2 hours to Bordeaux to the west, Limoges to the north. 20 minutes to Brantome. Verteillac has a bank, post office, restaurants, art galleries, church, general dealer store, doctors, pharmacies and Riberac, 15 minutes away has a great Friday market, supermarkets, cinemas and anything one could need. The surrounding country roads are perfect for cycling to beautiful neighbouring villages. Pack a picnic and canoe down the many rivers traversing the Dordogne. Booking Notes: Please let us know your preferred dates by phone or e mail and a deposit of half is required to secure your booking and the balance six weeks prior to required occupation (if possible), payable by cheque sent to our address. Changeover Day: Generally the cottage is rented from Saturday to Saturday, but if there are no other conflicting bookings, there is some flexibility. Notes on prices: Prices shown are for the property per week in UK Pounds.